Yes, this research on Illegal Dumping Monitoring With Implementation of WorldView-2 Imagery isn't brilliant (my skills in remote sensing and English could be better), but if you are interested in illegal dumping monitoring it may provide you with some insights. And don't hesitate to contact me if you would like to cooperate in illegal dumping researches. One of the most interesting finding of the research is that it is hard to distinguish illegal landfill from the construction site (which is crucial for St. Petersburg). So it is necessary to use cadastral data to determinate type of the land use of the land parcel (cadastre contains information if there are construction works at the given parcel). 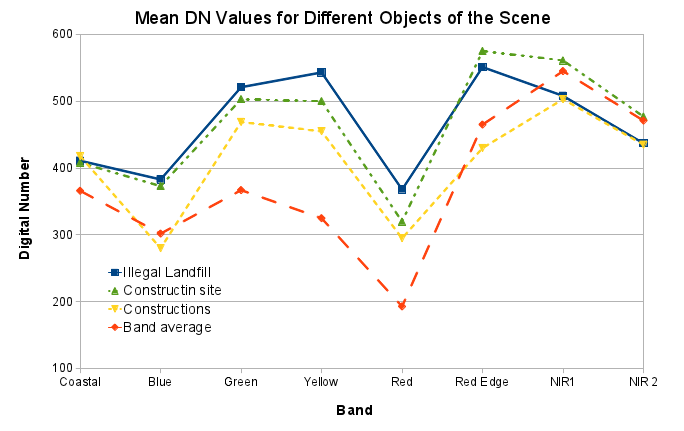 Mean values of digital numbers for Illegal Landfill,Construction Site and Constructions (buildings) at WV-2 imagery. Also I wasn't able to test Change Detection method (using Non-Homogeneous Future Difference index calculation method developed for WV-2) properly, because I haven't ordered multi-temporal imagery in the first place... But seems that it can provide some advantages. See the paper for more information.